The chief constable has said he is surprised the police ombudsman did not recommend criminal charges for officers he said colluded with a UVF gang that killed six Catholics 22 years ago. A report into the attack on the Heights Bar in Loughinisland by the ombudsman last week said the killers had been protected from investigation. But Michael Maguire did not use powers to have any officers involved arrested. He also did not send files to the Public Prosecution Service. The ombudsman has said there was insufficient evidence to support criminal charges. Families of the victims of the Loughinisland attack said they had been vindicated by the report's findings, and called for all of those involved to be brought to justice. It is the responsibility of the police ombudsman to investigate alleged criminal behaviour by current and former police officers. His investigators also have the power to arrest suspects, and can recommend that they face charges. 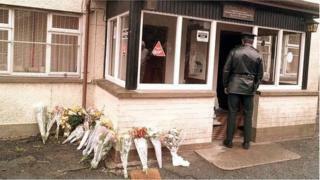 Mr Maguire was highly critical of some of former members of RUC Special Branch. He said police informers involved in the Loughinisland attack, and the importation of a huge consignment of weapons from South Africa, had been protected. "Some police officers appeared to place more value on gathering information and protecting their sources than on the prevention and detection of crime," he said. But he did not have any of the former officers arrested, and did not recommend to the Public Prosecution Service that they should face charges. In an interview for Tuesday night's BBC Spotlight programme, the chief constable has expressed surprise. "There does seem to be some sort of distance between the strength of the language in the report, in the fact that we're not having police officers even reported to the PPS," he said. "If I got to a point where I was convinced in a very clear way that collusion was a key element of the Loughinisland murders then I'd be looking to take that conclusion into evidence through arrests, interviews, charges." A former police ombudsman, Nuala O'Loan, told Spotlight that bringing charges would be extremely difficult because of the relationship between police informants and their handlers. "The problem that you have when you do these investigations as a police ombudsman is that the paramilitaries with whom the police officers were colluding are the witnesses for the police ombudsman, and the police officers whom the police ombudsman is investigating are the witnesses for the police investigating the paramilitaries," she said. The current ombudsman has said that while there was sufficient evidence for him to say some police officers had been involved in collusion, there was not enough evidence to support criminal charges. In a statement to the BBC, Michael Maguire said their investigation found evidence "that crimes may have been committed but with the passage of time some witnesses were no longer available, some documentation was missing and it was not always possible to get a detailed picture of the role of certain individuals". He said a number of related issues referred to in the Loughinisland report are still under investigation. Spotlight will be on BBC One Northern Ireland at 22:45 BST on Tuesday 14 June.